Thanks Elizabeth Cox (Bay Heritage Consultants) for sharing this interesting back-story below (previously published on Scoop). It has Talk Wellington pondering – can we imagine better more sustainable transport options by taking inspiration from our past? 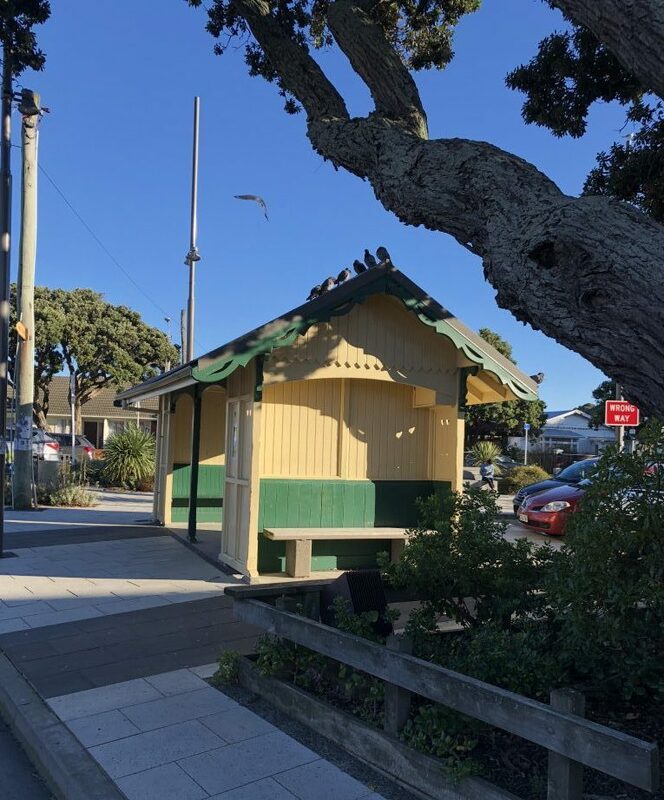 Surely we can re-instate the status of this little building as the cutest bus stop in Wellington – along with more bus services for commuters from the eastern suburbs! As part of the recent bus system changes in Wellington one building left with an existential crisis is the diminutive Miramar tram/bus stop, in the central island of the Miramar shopping centre on Park Road. However, the Miramar shops tram shelter (built by the Miramar Borough Council which ceased to exist in 1921, rather than the Wellington City Council) is one of the Miramar Council’s last remaining constructions, with the notable exception of the Seatoun tunnel. Having two councils running the system meant that people traveling to and from the city on the tram had to buy separate tickets for the same trip, a source of constant complaint from passengers. ‘a swift, continuous and delightful ride of miles will be enjoyed. In a word, a magical wand of the highest civilisation of the Twentieth Century has touched Miramar’. A year after borrowing money to build the tram system, the Miramar Borough Council borrowed even more to build a series of tram sheds. Photographs of the other shelters built at the same time show that they were built with similar decorative details, including the same love-heart cutouts, arch shapes over the entrances, and raised exterior boards. One of those was the Seatoun Terminus, seen below, which sat in the middle of the crossroads in Dundas Street. This terminus was removed in 1958, when trams were being replaced by trolley buses. Mural by Chris Guise at the Roxy depicts historic Miramar monuments such as a theme park, first state home and trams! Once the tramway had been installed, the suburb grew quickly, and the Miramar tram shelter began to be surrounded by shops and houses. As the number of shops extended down Park Road grew, and after the Capitol (now Roxy) Theatre was built across the road, it was particularly busy at night as well as during the day. It was also used as a taxi stand, and was where the Evening Post newspaper boys sorted their papers. Because it was the closest tram stop to the Miramar Wharf, the Miramar gasworks and the gasworks tramline, it was also particularly busy with workers from these places. This tram stop was also almost definitely the site of a scene in 1914 when wharf workers, protesting having to work with Chinese workers at the wharf while their ships were berthed in the city, threatened them with violence. The Chinese workers were met at the tram stop by the wharfies, and told that they would be followed home at the end of their shift and beaten. The Chinese workers had to be escorted home that night by the police to ensure their safety. The tram shelter was also used in the 1930s for Labour Party election hustings meetings, as were other tram shelters around the city. Trams were discontinued to Miramar in 1957, replaced by buses (first diesel, then trolleys, and then just recently, electric), which used the same route. 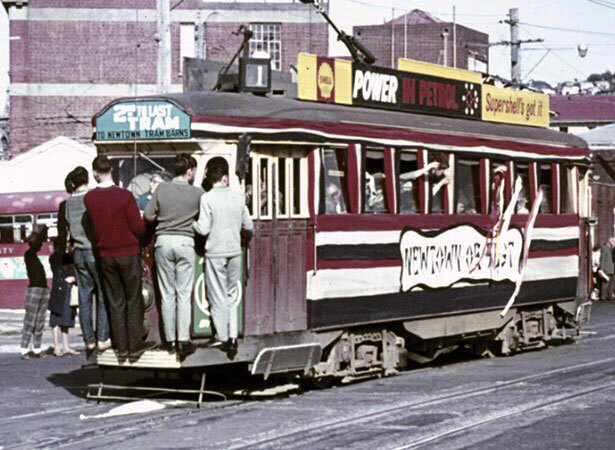 Wellington trams took their final cross-town trips in May 1964. It is such a conspicuous site which helps define the character of Miramar. The triangle and the shelter have been the cause of a number of battles between locals and the two local councils that have managed it over its history. 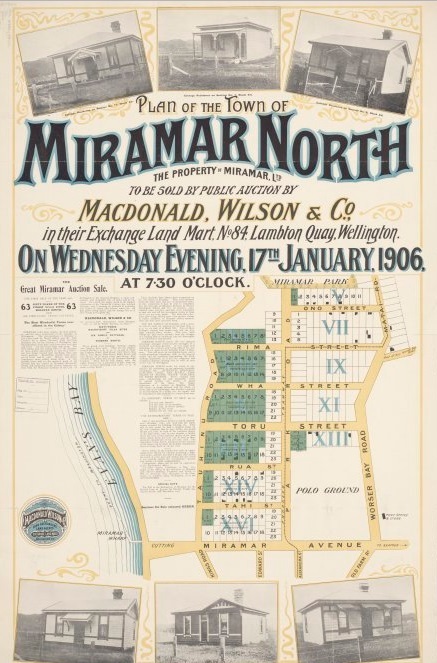 Despite the development of the suburb, by 1930 there was still no public toilets in Miramar, and the Miramar Progressive Society carried out a long campaign to have public toilets built on the traffic island. This was finally done in 1935. The toilets were small, art deco, and solely for men. Clearly having forgotten that their similarly named predecessors had campaigned for many years to have toilets built in the first place right next to the Miramar tram shelter – in the late 1950s the Miramar Progressive League campaigned for the removal of both the tram shelter and the toilets. Instead, in 1975 building of toilets for women was approved, forty years after the men’s toilets were built. They were attached onto the back of the tram shelter. In 1997 both the men’s and women’s toilets were demolished and the new standard-issue city council toilets built. These were removed in the 2010s, when the shelter was restored and returned to its former glory. And then from July 2018, with all the changes to bus routes and timetables, the Miramar bus stop is apparently a bus stop no more. The question remains – if it is not a bus stop – what is it? Elizabeth Cox is touring NZ this September as part of the NZ Festival of Architecture, with her talk “Their Presence Could Work a Revolution”. Follow her on Twitter for more heritage blog posts. Do you live in Miramar? Do you think this shelter on the corner of Park Road should be a bus stop once more? Or, could it be used more creatively…. Pop-up e-bike hire stop? Toy library? Community swap shop? Oh for heaven’s sake, is there nothing that the Regional Council can do without messing it up? What on earth reasons do they have for stopping it being a bus-stop? It’s demonstrably better than any of the modern replacements, which are really just glorified poster-sites, and rarely keep the weather out. This is an exemplary illustration of how to do a bus stop that actually keeps the rain out. And its historic. And heritage. And a perfect part of the local streetscape. Do buses not stop nearby any more? Is this not a better example as a bus hub, than their pathetic unfinished examples? What do we have to do to rid ourselves of these idiots? Isn’t it Wellington City Council who are responsible for the stops?